I love my slow cooker. It’s so nice to be able to just put the ingredients in it in the morning and have dinner ready and waiting for us when we get home. And at 3.5 quarts, it’s plenty big enough to feed the two of us with enough leftovers for several lunches, and it’s also a great way to feed a crowd. But when most people think about slow cookers, they think about things like meaty stews or pot roasts–obviously not going to fly around here! However, slow cookers are also great for cooking beans. And lentils, and chickpeas, and black eyed peas, and just about anything that you normally have to soak overnight and then boil for an hour. Conveniently, these are all things that form the basis of a lot of Indian dishes, and so that’s what usually gets made in our slow cooker! So on to the evolution of this fusion curry. I’ve been wanting to make my own curry paste for a while, and as I had a whole bunch of long green chiles from the farmer’s market, I decided now would be a good time to do it. 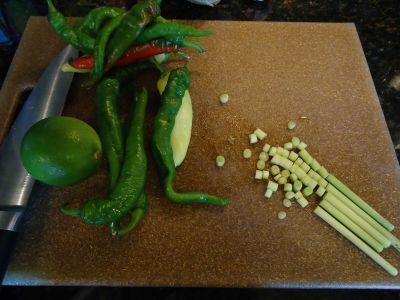 After a bit of googling, I discovered that the key ingredients for green curry paste are green chiles, lemongrass, kaffir lime zest, shallots, garlic, cilantro, coriander seeds, cumin seeds, salt, shrimp paste, and galangal. Now for obvious (vegetarian husband) reasons, shrimp paste was out, but I figured that its primary contribution was salt, so if the paste tasted bland, I could always just add soy sauce (or more salt!). Galangal was a bit more of a problem–I had nowhere to get it. The Asian grocery store might have had it, and there are probably places in the city that sell it, but I was not about to go on a wild goose chase all over town. So I decided to substitute ginger. Yes, I know, it’s not authentic, but ginger tastes good, is readily available (I always keep some on hand in the freezer), and goes with all the other flavors. So ginger it was! I ended up with rather a lot of curry paste. Several cups of it in fact. The first day I made it, I made a coconut curry on the stove with Thai eggplant, broccoli, kale, and soba noodles. It…wasn’t that good. I had tried simmering the vegetables in the coconut milk and curry paste but by the time the vegetables were reasonably cooked through, the coconut milk had reduced way past what I had wanted, and to be perfectly honest, I just don’t like eggplant very much anyways. So the next day I decided to try again, this time in the slow cooker. Using a little inspiration from the cookbook’s black-eyed peas recipe, I decided to go with a combination of chickpeas, black chickpeas (which are slightly smaller than the regular ones) and black-eyed peas. If you’re making your own version, feel free to use whatever combination of dried beans you like. After giving them a good rinse, I put them in the slow cooker along with four and a half cups of water and all of the leftover curry paste, plus some turmeric and a bit of brown sugar to provide a sweet note to counter the spice. And then I just let it cook. I set the timer for eight hours, and about ten minutes before the end I added a can of coconut milk and some vegetables–broccoli and green pepper. I did end up adding an extra half hour to the cook time because the vegetables weren’t fully submerged so they didn’t cook as quickly as I had expected. The end result? Much better than making it on the stove and definitely delicious! Toast the coriander seeds and cumin seeds in a dry pan over medium heat for a few minutes until fragrant. Keep them moving in the pan so they don’t burn. Then put them in a spice grinder with the peppercorns and grind them up. Set the mixture aside. 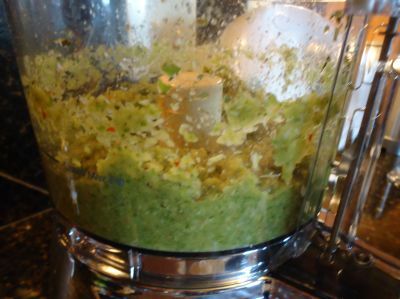 Put the chiles, onion, garlic, ginger, lemongrass, cilantro, lime zest, and salt into a food processor* and buzz it up until you have a relatively uniform consistency. Taste it, and adjust the ingredients if you need to. (Be sure to have a glass of milk on hand to quell the burning afterwards!) Add the ground up spices, and run the food processor a bit longer until everything is fully incorporated. Set aside. Measure out your chickpeas and/or other beans and give them a good rinse. Check for very small rocks (which, despite what you may have heard, do not float!). Put them in into the slow cooker and add 4.5c of water. Add 1-2 cups of your fresh curry paste (depending on how spicy you want your curry to be), the turmeric, and the brown sugar. Mix everything up, cover it, and set your slow cooker to high for 9 hours. Go about your day. After 8 hours, the beans/chickpeas should be fully cooked. Give everything a good stir, and then add the coconut milk and vegetables. Stir again, cover it back up, and let it continue to cook until the vegetables have reached your desired level of done-ness. Depending on how well the lid of your slow cooker seals and how submerged the vegetables are, this could take anywhere from 10-30 minutes. When they’re done, stir, serve, and enjoy! Leftovers should keep well in the fridge for several days at least, and leftover curry paste will last a day or two. *If you don’t have a food processor, you can do this in a mortar and pestle. Just chop everything as finely as you can first, and be prepared to put some muscle into it! *Okay, so technically it came out as more of a puree. But you can make it soup-like if you want. More on that in a bit. On this chilly (and if you’re in the Northeast, snowy) day after Halloween, you might, like me, find yourself craving soup. 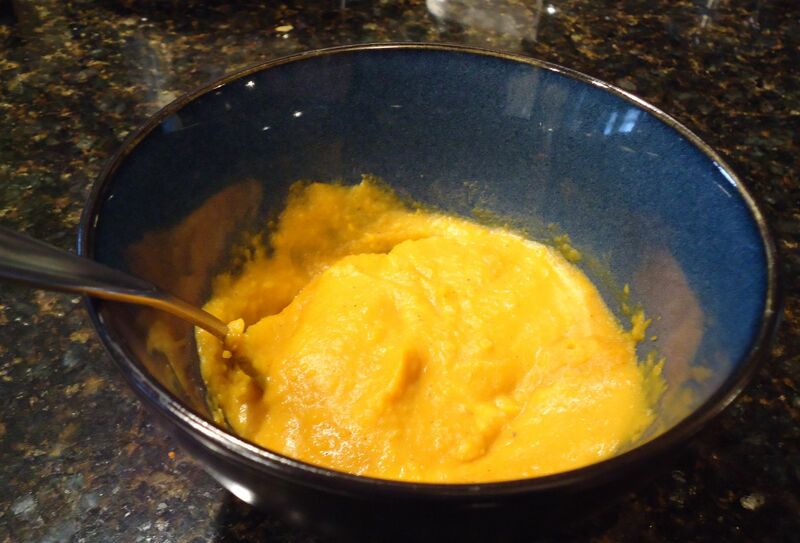 I actually made this soup a few weeks ago, but with its lovely orange coloring, it’s really quite appropriate for Halloween. Plus it’s warm and filling and delicious! Just what I want when the weather turns cold! Originally when I bought the butternut squash, I had intended to make a more typical, savory butternut squash soup. But when I realized I didn’t have half the ingredients for the recipe I wanted to use, I decided to go in a completely different direction and make something with coconut milk and curry paste. This turned out to be an excellent idea, with the sweetness of the coconut milk and the mild spice of the curry paste perfectly complementing the sweetness of the squash. And best of all, it was really easy! Preheat oven to 400 degrees. Then slice your squash down the middle lengthwise and scoop out the seeds. (You can toast them later if you like!) Set the squash halves face up on a cookie sheet (aluminum foil underneath would not be a bad idea–sometimes the squash drips!). Put a few small pats of unsalted butter on each half, and then sprinkle with the brown sugar, cinnamon, cumin and cloves. Bake the squash until it’s tender and a fork goes easily through the thickest part. (Probably between half an hour and 45 minutes but it depends on both your squash and your oven.) 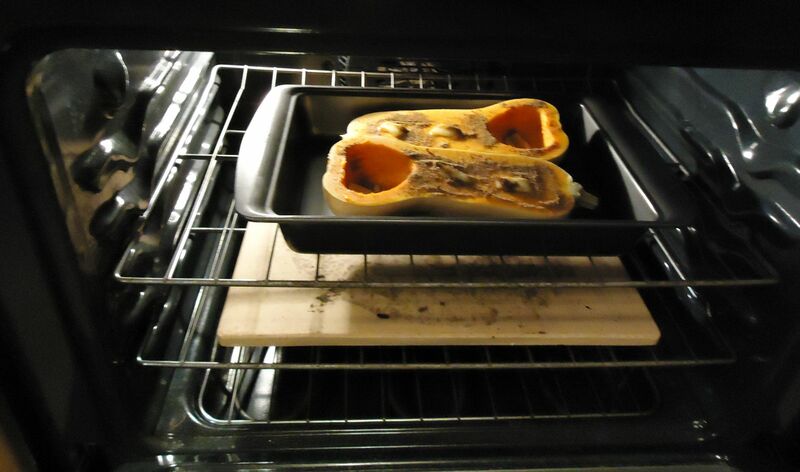 When your squash is done, take it out of the oven and set it aside to cool for a bit. Meanwhile shake up your can of coconut milk and pour it into a medium saucepan along with the curry paste. Put it on low-medium heat, and stir it until the curry paste isn’t lumpy anymore. While it’s heating up, scoop out the flesh of your squash. Once the coconut milk and curry paste are hot but not quite boiling, take it off the heat, add in the squash, salt (to taste), cayenne, and ginger. Mix it up a bit with your spoon, and then use an immersion blender to smooth it all out. If you don’t have one, a regular blender would work fine too–you just might lose a bit of soup in the bottom of it. Once it’s all blended, put it back on the heat for a bit if it’s cooled off and then serve! If you want to make your soup more…soupy, there are a couple of options. 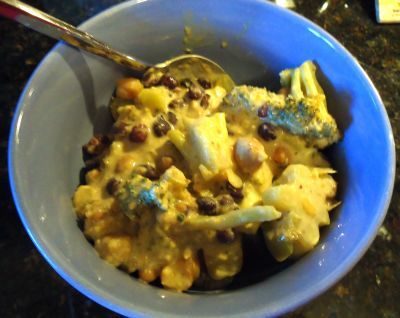 You could try adding another can of coconut milk (add more curry paste and possibly more cayenne and ginger if you do.) You could also try thinning it out with stock, milk, or cream–just taste as you go and adjust the seasonings, but with these you’ll probably lose some of the coconutty flavor. Just a disclaimer–I haven’t tried any of these variations because I decided I liked the soup thick. If you try one, let me know how it goes!